Since 1958, following the pioneering work of L. M. Kachanov, the theory of damage mechanics has in particular made significant progress and established itself capable of solving a wide range of engineering problems. To date, the damage mechanics is a clearly identified scientific discipline focused on studying the effect of various nano, micro and macro defects on the behaviour of materials, bridging the gap between the well established fields of continuum inelastic deformations and the classical fracture mechanics with growing macroscopic cracks. The main objective of the newly created conferences series entitled the nth International Conference on Damage Mechanics (ICDMn) is to bring together leading educators, researchers, scientists, engineers and other practitioners discussing and exchanging ideas on recent advances in the field of damage mechanics. On the foundation of the International Journal of Damage Mechanics (IJDM) , this conference series, held every three years, aims to become the premier international forum on damage mechanics research dissemination. The inaugural conference of this series named ICDM1 (the First International Conference on Damage Mechanics) took place in Belgrade during 25-27 June 2012 and attracted many leading researchers from 46 countries on five continents in the field of damage mechanics. 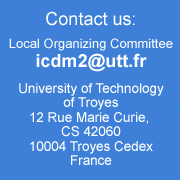 This Second International Conference on Damage Mechanics (ICDM2) will be held at the University of Technology of Troyes (France), from 8 to 11 July 2015. It will provide a forum for scientists and practicing engineers alike to present the latest findings in their research endeavor and at the same time to explore future research directions in the field of damage and failure mechanics. Both the irreversible damages and the reversible damages due to self-healing are concerned.